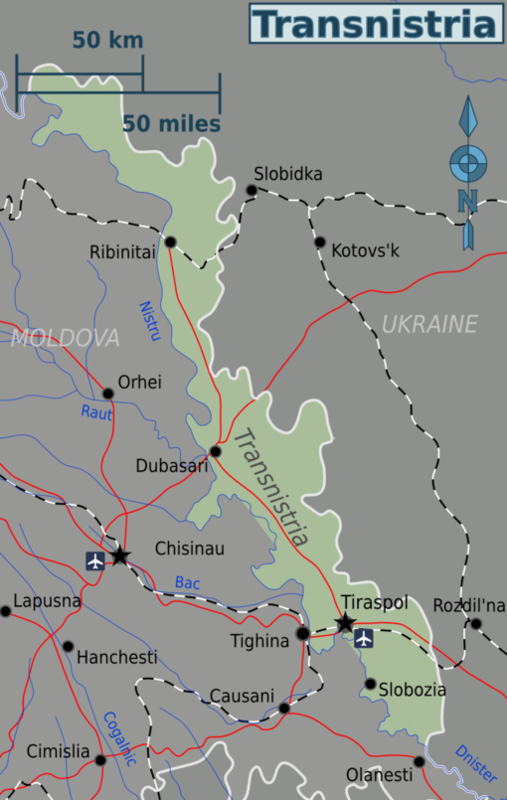 Transnistria (locally called by its Russian name: Pridnestrovie; and occasionally, in English: Trans-Dniester) is a de facto state in Eastern Europe that has declared independence from Moldova, although is currently recognised by 5 UN member states (Russia, Nicaragua, Venezuela, Nauru, and Syria), and four UN non-member states (Sahrawi Arab Democratic Republic, Abkhazia, Republic of Artsakh (Nagorno-Karabakh). It roughly corresponds to the territory between the Dniester River and Ukraine. Transnistria (official name Pridnestrovian Moldavian Republic; in Russian Pridnestrovskaia Moldavskaia Respublika, PMR) is a part of Moldova that declared its independence in 1990, resulting in a civil war that lasted until 1992. Transnistria Is recognized by only 5 United Nations members (Russia,Venezuela,Nicaragua,Nauru,Syria) but maintains its functional autonomy with military and other support from Russia. Transnistria is divided into 5 administrative regions and two free cities. 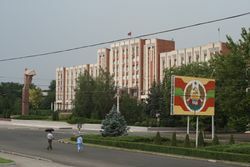 Transnistria does not require foreign visitors to obtain a visa; they can stay for up to 45 days without a residence permit. The procedure for entry into Transnistria from Moldova is pretty straightforward (as of June 2018); any travel document valid for Moldova and/or Ukraine (depending on point of entry) is sufficient (for example, EU/Schengen citizens need only a national ID card for Moldova, the same applying to Turkish citizens going to Ukraine). You will be asked by the border guards (some of them speak decent English), your reason for visit (tourism/business), and what hotel you plan to stay at. Then you will be given a entry card that allow you to stay in Transnistria for a stay of up to 45 days. When entering by minibus usually no checks are performed - instead the minibus driver will ask if any passenger needs registration (the residents of Transnistria do not). The passengers needing it will get out and go to migration office - follow them. If you do not speak Russian or Romanian, it is worth showing your passport (cover only) or ID card to the driver who would then assume by default you need to register. When crossing the border between Moldova and Transnistria, you will be checked only by Transnistrian officials. There are also peacekeeping Russian and Ukrainian soldiers who may stop and search vehicles. Do not try to take photos of the soldiers or the control posts. If you have problems with the Moldovian police, call the anti-corruption centre at +370 222 57333. Note that a tourist information centre exists in Tiraspol, very close to the railway/bus station, and provides you all necessary information (map of the city, places to visit and how to reach them, transport costs etc.). One of the two women working there is fluent in English and very helpful. From there you can also buy souvenirs (since there are no touristic shops). It has a Facebook page (VisitTransnistria). If entering Transnistria from Ukraine by road at Kuchurgan, Moldovan border police is available at the Ukrainian checkpoint, and can issue an entry stamp on request. If entering elsewhere, including by rail, you will not get a Moldovan entry stamp. If you then leave Moldova through a crossing controlled by Moldovan authorities, you may have problems with the Moldovan immigration authorities, which may try to claim that you entered Moldova illegally. See below for advice to avoid this. Exiting Moldova through Transnistria to Ukraine (whether having a Moldovan entry stamp or not) causes no problems - even a subsequent visit to Moldova through one of border crossings controlled by the Moldovan authorities doesn't raise problems with the border guards. The official Moldovan stance on the missing entry stamp can vary. Upon leaving Moldova, the immigration officers may insist that you should have registered with the Ministry of Information, Technologies and Communication (earlier address 49 M Kogalniceanu str, Chişinău; then moved to 42 Pushkin str. office 116., Chişinău, now moved again; see below) within 3 days (72 hours) of arriving to get a Moldovan entry stamp. However, not all guards are aware that the Ministry of Information has stated that a Moldovan entry stamp is not needed and that your Ukrainian exit stamp is sufficient. It is worth your while being firm in pointing this out to them. Arguing this point with the officials can be daunting but they will back down after harassing you and making a few phone calls to verify the official stance. However, if you did not get an entry stamp you are strongly recommended to register with the immigration office in order to be able to leave Moldova without difficulties. This applies especially if you plan to leave via a less-used border crossing where you may be the only foreigner, or if you hold a passport from an "exotic" (non-European/CIS) country that the border guards are not used to seeing. The registration process used to be complicated and time-consuming but nowadays it is quite simple (although speaking at least some Romanian or Russian will be very helpful). Go to the Moldova Migration Authority office on 124 Ștefan cel Mare street (the main avenue in the city center; close to Piața Marii Adunări Naționale trolleybus stop), take a queue ticket and tell the person on duty that you entered via Transnistria, want to register and point to the Ukrainian exit stamp in your passport. You will recieve a small piece of paper with a registration stamp (but no stamp or note in the passport itself). Keep it and leave it to the border control staff together with your passport when you leave Moldova. Transnistria does not have its own international passenger airport (it has a military or freight airport), so the best way is to fly to Chisinau in Moldova and travel from there. It is also possible to access from Odessa in Ukraine via bus. Note: The border crossing from Rybnitsa into Ukraine, on the Ukraine side is known by all expats in Ukraine as a place that you will be shaken down for a bribe to enter the country. Yes, even when all your papers are completely in order. They always seem to want between $50-100 USD. I have spent more than 6 hours stuck at the border while they shook me down and then when I refused to pay them they let me walk back into Transnistria after 3am. I got to walk in February, back across the border, go back through Transnistrian customs/entry. Then find a marshutka into Rybnitsa. The next morning I took a bus from Rybnitsa to Bindery, and then hoped the bus across into Ukraine without any issues at the border. I routinely took the bus from Kiev to Rybnitsa, between 2010-2012 and always had a hassle with the border guards in Ukraine at that crossing. Cars can enter but expect delays of up to an hour at border crossings in busy times. Note that foreign nationals driving their own vehicles are prime targets for border guards trying to extract bribes. According to the official hotline of Transnistrian customs there is an official road tax (USD5), but when we entered with a Moldovian rental car in March 2015 and November 2016, there was no fee. If they want you to pay, ask for a receipt. Note that not all border crossing points are allowed/able/willing to process foreign cars in customs. They may tell you to cross the border at a bigger crossing point. You will need a special permit from the Moldovian rental car agency if you plan to cross into Transnistria with a rental car from Chisinau. Some agencies will say that it´s not possible to do so, but this seems to be a more political thing than a practical. At time of writing, Prim Auto  and SIXT (+ €20 charge) at the airport could provide the necessary paperwork, while Europcar and Hertz said no. There is a relatively frequent (about every 30min, 07:00-18:00, less frequently as early as 05:00 and as late as 22:00) bus service connecting Chişinău and Tiraspol. Departs from the central bus station, behind the Central Market in Chisinau, final stop is Tiraspol railway station. In February 2017 I paid 37MDL for a Chisninau->Tiraspol ticket, while the return, as of December 2018, is 28.5 Transnistrian rubles or 31 Moldoavn lei. Destination signs on mini buses are often in Cyrillic only. Mini-buses back from Tiraspol leave from Tiraspol train station. There are many buses back towards the end of day but the last minibus back was at 18:30 (Feb 2017). Marshrutkas (minibuses) also run this route. At April 2018, the Chisninau->Tiraspol minibus fare was 36.5MDL. The return fare (Bendery->Chisninau) was 35MDL. The fare at the Bendery bus station could be paid either in MDL or Transnistrian rubles (this was probably also true at Tiraspol). Direct Odessa->Tiraspol buses are not so frequent. However, buses from Tiraspol to the border at Kuchurgan (Кучурган) and from Kuchurgan to Odessa are frequent. From Odessa to Kuchurgan, you need one hour ride (with no traffic), and other 30-45 minutes from the border to Tiraspol. As of February 2018, the cost from Odessa to Tiraspol is 136 UAH (approx. 4,1 euros), and from Tiraspol to Odessa 41 Transnistrian roubles (approx. 2 euros). Check AVPMR  for official timetables of local and international buses. From the Bendery crossing to Chişinău, a taxi costs 100 to 150 Moldovan lei. A marshrutka costs around MDL25. Marshrutkas between Odessa and the Kuchurgan border (on the main road to Tiraspol) are fairly frequent and cheap. There are hardly any train connections within the country, so the bus -- if available -- will be your only choice. Marshrutkas (minibuses) zip between cities much faster (and often more frequently) than buses. They cost a little more, but travel much faster and can be hailed anywhere along their route. If you flag down a marshrutka, it's customary to pay on entrance. You will find a decent trolleybus line between Bendery and Tiraspol that seems to run quite frequently, with some rather modern buses by ,well, post-Soviet standards. Taxis in Tiraspol are very common and are quite cheap. As always, be a little wary of cheating taxi drivers and be sure to negotiate a price before you get in the taxi, although most drivers in Transnistria are surprisingly honest and more and more of them are using meters. If you miss the last bus to Kishinev at 18:35, you can take a taxi from Tiraspol to Kishinev, which should not cost more than USD30. If you have your own rental car, you can drive around and explore quite freely. Check that the permission you got from the car rental is valid all over Transnistria, and not only for a specific route. Be aware of Russian checkpoints - there are areas that are off limits, these seem to be related to military bases. Getting too close to them might look suspicious and land you in trouble. If you know where they might be, please post them here. The three official languages of Transnistria are Russian, Moldovan (which is almost the same language as Romanian, written in the Cyrillic script in Transnistria) and Ukrainian. Russian is the lingua franca and the language of government. Some people speak English, German, or even French. After the official languages, English and German are the most common. Young people especially may speak English, but it is still a good idea to know some russian words and phrases. Furthermore, even people who speak some English (or another foreign language) can be quite shy about it, and may deny that they speak it even if they have been educated in it. Keep in mind there is essentially zero tourism in Transnistria. If you are a native speaker of a foreign language, there's a good chance that you're the first native speaker the person you are talking to has ever spoken with. Road signs, menus and so on will almost always be written in Russian. Tiraspol does not exactly boast a shopping mile; shops are few and have a limited choice. The official currency is the Transnistrian ruble (which can be used and exchanged only in Transnistria), and few if any businesses accept any other currency. Some hotels will accept payment in Moldovan currency. Exchange offices are very common; many are open 24 hours and will happily give you Transnistrian rubles in return for euros, US dollars, Moldovan lei, Russian rubles or Ukrainian hryvnia. You can also exchange English currency at branches of the Agroprom bank. Official exchange rates can be found at the website of the Trans-Dniestr Republican Bank. Trading Transnistrian rubles into other currencies such as euros or US dollars may turn out to be difficult. However, trading Transnistrian rubles for Moldovan lei at the main bus station in Tiraspol was not a problem. Remember to do this before you leave - don't even think about trying to change Transnistian rubles outside Transnistria, no-one will touch them. There are excellent deals in brandy made locally to a world class standard, about USD3 a bottle. Cigarettes are very cheap too. There are also arts and crafts to buy as well. A good exchange point is the Kvint store in downtown Tiraspol--there is an exchange office with good rates right inside the shop. There is also an exchange booth at Tiraspol the bus/train station. International credit/debit cards and traveller's cheques are not accepted anywhere in Transnistria. However, there are ATMs all over Tiraspol. These are connected to the Russian banking system and will dispense Russian rubles that you will need to change for the local currency. There is a large open-air market in Tiraspol, close to the Suvorov's monument, and another in Bendery, located a few meters away from the bus and marshrutka station. There are a variety of goods, from whole hogs heads to hand-knitted socks to Chinese-made housewares. Open-air markets are always a great place to start. There are several restaurants serving local and international cuisine. There are no western fast food chains but there are three branches of "Andy's Pizza" restaurant in Tiraspol and one in Bendery. Their menu has an English translation and a few of the younger serving staff may speak some English. The "7 Fridays" chain also have a wide selection of international dishes. The menu is in Russian, but there are adjoining photos of all the choices. Some of the best food in Bendery is served by a Moscow-trained chef in the "Tighina" restaurant on Lazo str., 7 near Bendery-1 rail station. There are also cafeteria style restaurants like "Dolce Vita" which are very cheap usually around USD3-5 for a meal that includes a 3 course lunch along with desert and your choice of drink. Local wine and cognac are excellent and cheap. The Kvint factory is situated in Tiraspol, and Tiraspol has a Kvint store, offering incredible deals on Kvint products. Kvint produces arguably the best Cognac in the former Soviet Union, but is extremely hard to come by in Western countries (though Moldovan supermarkets will carry it). A trip to Transnistria is not complete without a sample. There is also a soft drink that is sold in the streets called Kvas. For about 50 US cents you can get a big cold cup of Kvas which is a Russian version of Root Beer. Anyone considering trying it should definitely go through with it, it is historic and good. 2 September: Independence Day. Parades are held in Tiraspol city centre all day. 8 March: International Women’s Day. Stay away from any political provocation - you may be watched by local security services. Even though it´s unlikely that bringing up sensitive matters will have any other consequences than a KGB interrogation, it´s best to avoid it to be on the safe side. Remember that your embassy will have limited ability to help you if you run into trouble with the authorities, given that Transnistria is not recognised by any other sovereign state. Be careful when taking photos. Avoid brandishing your camera around military checkpoints and other places that might have some sort of "strategic importance" (this definition can vary wildly). That said, taking photos of most public places and buildings in Tiraspol should be OK. The major cities are safer than Western European and American cities of similar size and economic makeup. Also, despite the political situation with Moldova, there is essentially no threat of being caught in a military action. There has not been fighting in Transnistria for many years. By far the biggest threat to the traveller is scamming. Despite scare reports, Tiraspol is very welcoming, mainly because it gets so few tourists. Some young people tend to speak English and are helpful. The city is well-policed. Street crime is low. Many Transnistrians are excited to see foreigners and will be very welcoming, if a bit shy at first. Some, however, see foreigners as being sources of easy money. Always negotiate the price of a taxi before you get in. Use pen and paper if you are not a Russian speaker. Ask about the prices of items before you order them at a bar or restaurant. It is not common to be scammed, but it is far from rare. However, even when scams are attempted, it is often for no more than a few euros. Transnistria has an international reputation of being a haven for money laundering, human trafficing and sale of weapons. In light of this, in might sound surprising that the new president is cracking down hard on bribery- just call the hotline if any police attempt to extort bribes from you. Also, be aware that while enforcement is not particularly strict, drinking on the street has recently been made illegal and while this reform is (needless to say) extremely unpopular, it's probably best to avoid any run-ins with the police. Medical care is almost non-existent in Transnistria, especially for non-citizens. Furthermore, even if you have travel health insurance it will often not be valid in Transnistria (but valid in Moldova). It's advisable to check in advance with your insurer. Be careful in Transnistria's bars during the night. There are often Mafia-like characters having a good time with rolls of dollars and you should not inquire too closely about the source of their wealth. Internet access is surprisingly good, city of Tiraspol provides free Wi-Fi access for 30 minutes and it can be used only once. This network is easy to find, it covers almost whole Tiraspol's main street (25th October Street) and surrounding streets. Internet cafes are not widespread yet. There is one in Bendery, in Gagarin Street (close to the city market) and another one in Tiraspol, near Andy's Pizza on 25th October Street. Restaurants 7Пятницъ (7 Fridays) and "La Placinta" in Tiraspol offer free Wi-Fi (Broadband) for their guests. Despite misleading information on the internet, whole area of Transnistria is covered with mobile signal by Orange. In 2005 the BBC published a TV series called "Places That Don't Exist" starring travel author Simon Reeve. One 30 minute episode titled Transdniestria provides a skeptical account of the political and social conditions of the de-facto state. A range of international media outlets such as The Telegraph have since built reports that put the nation in a rather negative light. This page was last edited on 15 April 2019, at 15:55.